I liked the fact that it was a story about sisters, and it was a short read. It’s a story about twin teenagers named Sarah and Annie. Sarah has an anxiety disorder and Annie has gained weight, and had a personality change. She holds a deep secret Their parents are in denial that the twins need serious help. Made me think of a lot of times when you see teens acting the way she does. Another eye opener for parents. I recommend parents to read it and kids especially girls would love it. From bestselling author Carol Lynch Williams (The Chosen One), a contemporary YA novel about a family that has been caught up in what doesn’t matter and how two sisters realize that their relationship—no matter how different the two of them are—is most important. In this contemporary YA novel by bestselling author Carol Lynch Williams (The Chosen One), fifteen-year-old fraternal twins Annie and Sarah are sisters, but that is where their interaction ends. Then Annie begins to withdraw from the family, forcing Sarah to investigate why-and the secret she uncovers changes their relationship forever. 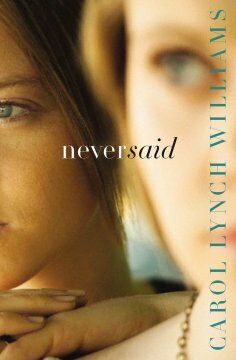 Never Said explores not only the effects of abuse but also our world’s reliance on self, beauty, and other people’s perceptions. With themes of forgiveness, love, sacrifice, and hope woven throughout the story, teens and other fans of young adult fiction will be drawn to this story of two sisters who must find a way to come together and find the healing they both need.